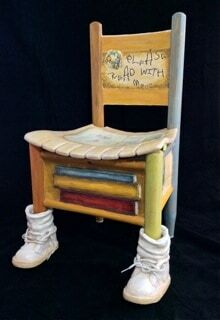 Today we have a guest post by Rita Coffern, who agreed to show us how she built her adorable chair using a variety of imaginative techniques, and, of course, paper mache. A little over a year ago, I did an internet search looking for instructions on how to sculpt a cat when I discovered Ultimatepapermache.com. This was without a doubt, a turning point for me as an artist. Thank you Jonni!! 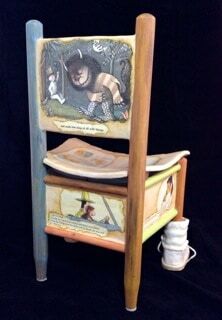 I create 3-D, functional art furniture. As my designs developed into more whimsical and sometimes more sentimental projects, I become frustrated with my efforts. My designs weren’t translating well into a finished product using the traditional method of paper mache and armatures made of wire mesh or chicken wire. They were coming out ridged and stiff, lacking the emotion I wanted to convey. I couldn’t identify the what was causing the problem. After watching several of Jonni’s videos, I eventually realized that the problem lie in my materials. I begin experimenting with her recipes and techniques, and Voila! Problem solved. Here’s my most recent project and another example of what the air dry paper mache clay can do. 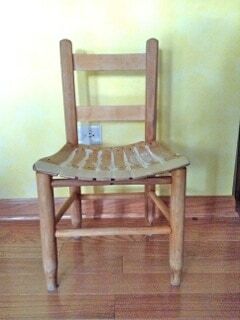 This 1960’s era oak child’s chair was structurally sound when I found it in a local thrift store but the finish was in really rough shape. 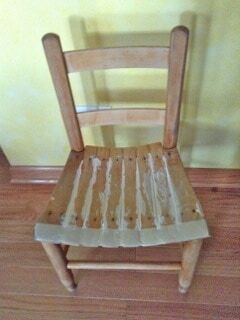 I sanded off the finish, then filled in the seat with joint compound. Layers of paper mache paste and shop towels were added to prepare it for an air dry clay tile that created a solid surface. The ends were left open creating a fringed look to add a little visual texture and whimsy. The shoes and socks were next and my favorite part of this project. 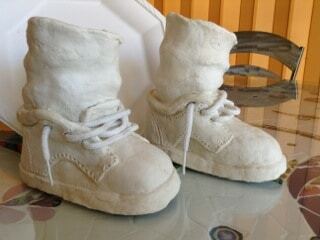 I picked up a pair of toddler shoes from my local thrift store and tucked an empty toilet paper roll in each. Modeling clay was used to sculpt the sagging socks. The shoes got a thin coat of rubber cement and cling wrap to prepare them for the multiple layers of paper mache paste and shop towels that were later applied. 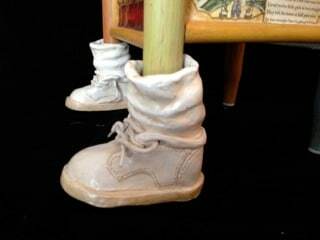 When the shop towels and paste were dry, they were cut away from the shoes and modeling clay. Any excess shop towel trimmed off and this became my armature. 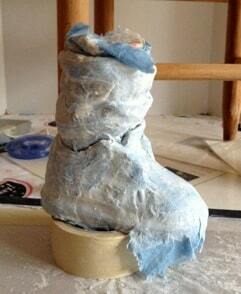 I repaired the cut edge of the sock and shoe using more paper mache paste and shop towel making it whole again. 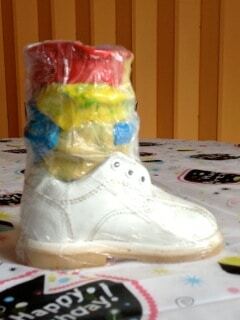 Layers of air dry clay were added until they looked chunkier and more like the shoes my girls wore at that age. (Or at least how I remember them, anyway.) 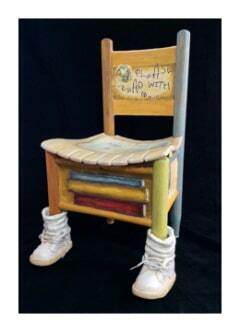 They were lightly sanded with a fine grade sand paper, then finished off with layers of acrylic paints to have that “well worn” look and the feeling of a cherished memory. The next step was to create the supports for the air dry clay tiles that surround the base of the chair and form the back support. Heavy cardboard was used, layering paper mache paste and shop towels over them; both inside and out of the seat and on both sides of the back support to give it stability. 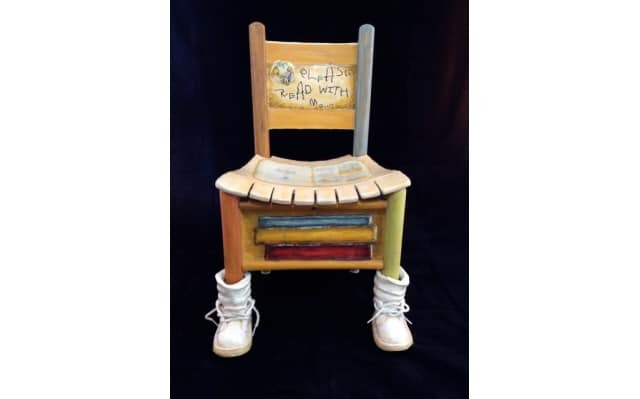 When it was completely dry, layers of air dry clay were applied creating the tiles and a stack of books was sculpted on the tile in the front of the chair. 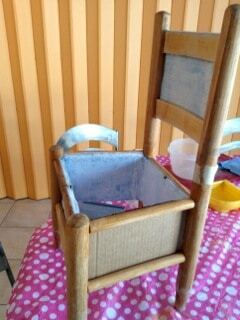 Finally, it was time to select the story book pages that would be decoupaged on the chair. I have so many favorites, as do we all, but ultimately went with the stories from an era in keeping with the chair, stories that meant the most to me as a child and the ones that trigger the warmest memories of my girls at that early childhood stage. Acrylic paints were used on the tiles and the story book pages to create an old “treasure map” type of appearance, symbolizing the treasured memories created when time is spent reading with a child. 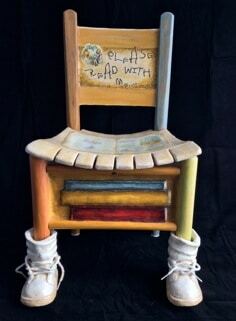 The stack of books was sculpted just below the seat to symbolize how we are shaped by what we read and in a sense how we stand on the shoulders of the authors whose books we read. The wood was treated to take on the look of watercolor paints to compliment the illustrations that were popular in that era of children’s books. 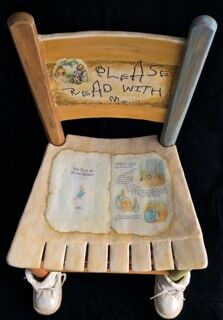 The end result is a sentimental, one of a kind piece that captures the heart and reminds us that we only get one chance to make the most this fleeting period of early childhood and to instill a life long love of reading. Hi Jim. I’m so glad you’re enjoying the recipes. But your example photo didn’t come through. iPhones don’t seem to work with the plugin, and also the image needs to be small enough (under 250k) for the plugin to work. I do hope you’ll try again – I’d really love to see your furniture. I’ve been thinking about making some furniture, as a matter of fact, and I could use some inspiration! And I love the work you show on your website, by the way! I agree with the comments below! You are truly, a very talented lady!!!! The paintings on the back and sides of the chair are exquisite; they look so like the authors’ works. Where The wild Things Are and Curious George really struck the little heart strings. Thank you for sharing your work, with us readers. In my opinion, Rita, you should have an Etsy shop, or one like it. Take Care. totally awesome and awe inspiring! creative work. love it! I’m…..I’m speechless. Truly! This is an awe inspiring piece, and I absolutely LOVE the encouragement behind it…..Please read with me:) Says it all! Will be sharing this, thank you! 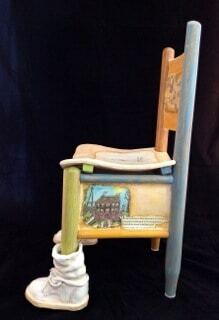 As a stand alone piece you really get the image of a child sitting on the chair perhaps reading a favorite book. I love the shoes and the slight angle of them. What a lovely and whimsical piece of art. Well crafted and exquisitely finished. Well done! Thank you for sharing, Rita. My own art has turned towards the whimsical, but I’d never have dreamed up something so adorable. You’ve inspired me to look for a way to express myself “outside the box”. I love the chair. When I was in school I went to the library every day and took a different book out. I think if it was possible to see the card where I signed a book out you would be surprised. I loved reading, swimming, ice skating, roller skating, bike riding and horses. I’m now 75 soon to be 76 and I don’t read much anymore but I paint portraits and play in my polymer clay and let my mind run wild. I also doing beading. The chair is wonderful and it brought back memories of my school time. Congratulations on your work. Thank you for such kind words, Christine you made my day. It’s a wonderful thought to inspire other artists the way Jonni inspired me. 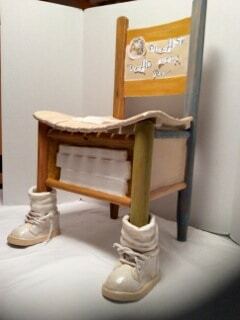 I donated the chair to my daughter’s school to be sold at their annual auction. I think I may need to make another one for myself though, I kind of miss it. Rita, what a magnificent piece of work this is. This really gives a new meaning to creativity. This embodies childhood 100%. Thank you for the step by step process you used. This should be inspiring for many an artist with ideas that need tweaking. Where is this adorable piece going to be displayed?